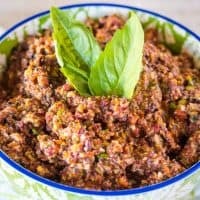 Three Olive Tapenade is delicious, full of amazing flavors, and very addicting! It's a perfect make-ahead appetizer for any occasion! Put the olives, capers, garlic, and red pepper into a food processor. Pulse in1-second intervals 10 times and then scrape down the sides of the bowl. Add the herbs, lemon juice, and olive oil and pulse another 10 times or so, stopping in the middle to scrape down the sides of the bowl. You want the pieces to be 1/8-inch to 1/4-inch in size so you want to see all the colors of the olives and peppers. Transfer to a dip bowl and serve immediately or cover with plastic wrap and refrigerate until ready to serve. All olives should be pitted!! Measurements are for about 1 cup of each type of olive.